1993-08-11 First worldwide family litigation filed litigation Critical https://patents.darts-ip.com/?family=27282022&utm_source=google_patent&utm_medium=platform_link&utm_campaign=public_patent_search&patent=EP0278601(B2) "Global patent litigation dataset” by Darts-ip is licensed under a Creative Commons Attribution 4.0 International License. A61F2013/530671—Absorbent pads, e.g. sanitary towels, swabs or tampons for external or internal application to the body; Supporting or fastening means therefor; Tampon applicators characterised by the absorbing medium having superabsorbent materials, i.e. highly absorbent polymer gel materials being mixed with mineral or inert material, e.g. "introfying particles"
The invention relates to a process for manufacturing an absorbent composite and an absorbent article including it. The composite is useful in absorbent articles in which the absorption and retention of a liquid are required, e.g. hygienic and medical articles such as sanitary napkins and disposable diapers (napies) and water retaining agents for use in agriculture and forestry, and a freshness-retaining agent for vegetables. It may be used as a sanitary pad such as a mother's milk pad, a childbed pad, an incontinence pad, a haemorrhoids pad and a surgical pad. In recent years polymers capable of absorbing water in an amount from several tens to several hundreds times their own weight - the so-called water absorbent polymers - have been developed and are used in hygienic articles such as sanitary napkins and paper diapers, medical materials such as contact lenses and coatings for sutures, separatory and purificatory materials such as carriers for liquid chromatography, or water retaining or water absorbing material in the fields of agriculture and forestry and civil engineering. Examples of known water absorbent polymers of the kind mentioned above include crosslinked polyacrylates, starch-acrylic acid graft copolymers, hydrolyzates of cellulose-acrylonitrile graft polymers, and hydrolyzates of vinyl acetate-acrylate copolymers. These water absorbent polymers exhibit excellent absorbency with respect to low-viscosity liquids such as water and urine and can rapidly absorb them in large amounts. Further, various proposals for the improvement thereof have been made. On the other hand, proposals with respect to a water absorbent polymer for absorption of a high-viscosity liquid, such as blood, include conversion thereof into a porous one (see Japanese Patent Laid-Open Nos. 71728/80 and 8711/84), addition of water-soluble organic and/or inorganic salts (see Published Japanese Translation of PCT Patent Application No. 501107/1983), and mixing with a hydrophilic fiber such as pulp (see Japanese Patent Laid-Open No. 86657/1984). However, the effects attained by these methods are not satisfactory. Therefore, it is desired to develop a water absorbent polymer which is excellent in absorbency, i.e., excellent in capacity, rate and power of absorbing not only a low-viscosity liquid but also a high-viscosity liquid. According to this invention we provide a process for manufacturing a liquid-absorbent composite which composite comprises (a) a particulate water-absorbent polymer, (b) a water-insoluble inorganic material and (c) a water-insoluble hydrophilic fibrous material having a fibre length not greater than 50 mm at a weight ratio (a) : (b) : (c) within the range 100 : 5-1200 : 5-1200, wherein (b) and (c) are present on the surface of the particles of (a), the process comprising the steps of (i) mixing (a), (b), and (c) with one another in the presence of 70 to 3000 parts by weight, based on 100 parts by weight of (a), of water, and (ii) drying the mixture. It is preferable that the composite has a bulk specific gravity of 0.03 to 0.7 g/cc. The polymer may for example be one formed from a water-soluble, ethylenically unsaturated monomer or a crosslinked product thereof, including acrylic acid or a salt of acrylic acid as the major component. The inorganic material (b) may for example be alumina, silica, zeolite, a clay of the montmorillonite group or a clay of the kaoline group. The fibrous material (c) is cellulose, natural or artificial. The invention provides an absorbent article comprising the absorbent composite obtained by a process as defined above. The water absorbent polymer useful for the present invention is generally any polymer having water absorbency. Examples of such a polymer include a polyacrylate and a crosslinked product thereof, polyethylene oxide, polyvinyl pyrrolidone, crosslinked sulfonated polystyrene and polyvinylpyridine, a saponified starch-poly(meth)acrylonitrile graft copolymer, a starch-poly(meth)acrylic acid (and a salt thereof), graft copolymer (and a crosslinked product thereof), a product obtained by a reaction of polyvinyl alcohol with maleic anhydride (and a salt thereof), and a hydrolysate of a starch-poly(meth)acrylate graft copolymer, Further, polyvinyl alcohol sulfonate, a polyvinyl alcohol-acrylic acid graft copolymer, etc. may also be employed. A preferred polymer is a polymer of a water-soluble ethylenically unsaturated monomer composed mainly of acrylic acid or an acrylate, or a crosslinked product of said polymer, which polymer may be produced by any method. These polymers may be used in any combination of two or more of them. The water absorbent polymer is preferably a polymer capable of absorbing water in an amount of at least 20 cc/g of the polymer and is in the form of powder, granules, a solid mass, or sheet. The composite of the present invention can be produced from a polymer in any of the above-mentioned forms. When the polymer is used in a powdered or granular form, it is preferred that the particle diameter be 10 to 300 µm, more preferably 15 to 1000 µm. The inorganic material to be used in the present invention must be substantially insoluble in water, and any material meeting this essential requirement may be used. Examples of the inorganic material used in the present invention include alumina, silica, titanium dioxide, talc, zirconia, calcium phosphate, barium phosphate, calcium sulfate, clay, silicic acid, diatomaceous earth, bentonite, activated carbon, zeolite, kaolin, acid clay, activated clay, vermiculite, and other metal oxides. Alumina, silica, zeolite, monmorillonite-type clays (e.g. bentonite), and kaolinite type clays (e.g. kaolin) are particularly preferred. The particle diameter of the water-insoluble inorganic material is not particularly limited. However, the particle diameter is preferably 1500 µm or less, particularly preferably 500 µm or less. Examples of the water-insoluble hydrophilic fibrous material useful for the present invention include materials having wettability and wicking properties characteristic of water-insoluble fibrous materials, such as cellulose powder, pulp, rayon, vinylon, cotton, wool, and cellulose acetate. The use of cellulose powder from natural or artifical cellulose, pulp, or rayon is particularly preferred. Further, in order to impart functions such as immobilization through fusion, hydrophobic fibrous materials, such as polyester, polyethylene, polypropylene, polyvinyl chloride, acrylics, and nylon, can be also used in the form of a mixture with these water-insoluble hydrophilic fibrous materials. Although the hydrophobic fibrous material may be used in a wide range of mixing ratios according to the applications of the composite as far as the hydrophilic nature is not spoiled, it is preferred that the content of the water-insoluble hydrophilic fibrous material be 60% by weight or more, preferably 80% by weight or more. The fibrous material may be used in any form of long fibers, short fibers and fine powder. The fiber length is preferably 50 mm or less, more preferably 40 mm or less. The water absorbent polymer, water-insoluble inorganic material, and water-insoluble hydrophilic fibrous material are used in such a ratio that the amounts of the water-insoluble inorganic material and water-insoluble hydrophilic fibrous material each based on 100 parts by weight of the water absorbent polymer are 5 to 1200 parts by weight and 5 to 1200 parts by weight, respectively, preferably 10 to 800 parts by weight and 10 to 1000 parts by weight, respectively, more preferably 20 to 500 parts by weight and 20 to 800 parts by weight, respectively. A composite from which any of these constituents has been omitted does not display the advantageous effects of the present invention and, therefore, is outside the scope of the present invention. When the content of the water-insoluble inorganic material is less than 5 parts by weight, the rate of absorption and absorbing power of the liquid absorbent composite are unfavorably small. On the other hand, when the content exceeds 1200 parts by weight, not only is the absorption capacity of the composite lowered, but also the water-insoluble inorganic material is not immobilized on the polymer, which makes it impossible to attain the benefits of the present invention. When the content of the water-insoluble hydrophilic fibrous material is less than 5 parts by weight, the effects on wicking properties and rate of absorption of the liquid absorbent composite are small, while when the content exceeds 1200 parts by weight, the absorption capacity of the composite is small, which makes it impossible to attain the purpose of the present invention. The ratio of the water-insoluble inorganic material to the water-insoluble hydrophilic fibrous material may be varied at will within the above-mentioned range according to the kind of the liquid to be absorbed and applications. Preferably, the liquid absorbent composite is prepared, by adding a water-insoluble inorganic material and a water-insoluble hydrophilic fibrous material to a water absorbent polymer which is in a sufficiently swelled state. Example of the method include a method which comprises feeding a swelled polymer, a water-insoluble inorganic material, and a water-insoluble hydrophilic fibrous material into a kneader-mixer, mixing them with each other and drying the resulting product, a method which comprises successively adding a water absorbent polymer, water, a water-insoluble inorganic material and a water-insoluble hydrophilic fibrous material to an organic solvent while stirring, subjecting the resulting mixture to filtration and drying the filter cake, and a method which comprises mixing a water-insoluble inorganic material with water in a screw rotary vane mixer, successively adding a water absorbent polymer and a water-insoluble hydrophilic fibrous material to the resulting mixture, mixing them with each other, and drying the resulting product. Other methods including a method which comprises adding a water-insoluble inorganic material and a water-insoluble hydrophilic fibrous material to a water-soluble ethylenically unsaturated monomer or a water-soluble ethylenically unsaturated monomer containing a cross-linking agent, allowing the monomer to polymerize, and drying the resulting product may be also employed, and the method of preparing a liquid absorbent composite is not limited to these ones. If necessary, the dried liquid absorbent composite may be subjected to a treatment such as pulverization. Water may be added not only in the form of a liquid but also by spraying or blowing in the form of steam and any of these methods can be favorably employed. The order and method of feeding the water absorbent polymer, water-insoluble inorganic material, water-insoluble hydrophilic fibrous material, and water are not particularly limited. However, a method in which the water-insoluble inorganic material and water-insoluble hydrophilic fibrous material are together added to the swelled polymer and a method in which the water-insoluble hydrophilic fibrous material is added to a mixture obtained by kneading the water absorbent polymer, water, and water insoluble inorganic material are preferably employed, because in these methods the functions of each material are sufficiently manifested. The method of mixing the above-mentioned individual materials is not also particularly limited and includes a method which comprises feeding a swelled polymer, a water-insoluble inorganic material, and a water-insoluble hydrophilic fibrous material into a mixer of a rotating container type or a mixer of the stationary container type, mixing them with each other and drying the resulting product, a method which comprises mixing a water-insoluble inorganic material with water, successively adding a water absorbent polymer and a water-insoluble hydrophilic fibrous material to the resulting mixture, mixing them each other and drying the resulting product, and a method which comprises successively adding a water absorbent polymer, water, a water-insoluble inorganic material and a water-insoluble hydrophilic fibrous material to an organic solvent substantially incompatible with water while stirring, subjecting the resulting mixture to filtration and drying the filter cake. In converting the above-mentioned water absorbent polymer, water-insoluble inorganic material and water-insoluble hydrophilic fibrous material into a composite through the medium of water, water is required to be present in an amount of 70 to 3000 parts by weight, preferably 200 to 1500 parts by weight based on 100 parts by weight of the water absorbent polymer. When the amount of water is less than 70 parts by weight, the deposition or bonding of the water-insoluble inorganic material and water-insoluble hydrophilic fibrous material to the water absorbent polymer is insufficient, which unfaborably makes it impossible to satisfactorily exhibit an effect attained by conversion to a composite, On the other hand, when the amount of water exceeds 3000 parts by weight, the gel strength of the water absorbent polymer is excessively lowered, which makes it difficult to conduct the conversion to a composite while maintaining the form of a polymer, thus causing a great change in the form of the resulting composite. This brings about not only a lowering in performance but also an increase in drying time and cost of drying. When the water absorbent polymer is used in a dried form, water may be added in an amount as mentioned above in the above-mentioned method. Alternatively, the water absorbent polymer used may originally contain water in an amount corresponding to a part or the whole of the above-mentioned amount. That is, a water-containing polymer before drying in the process for preparing a water absorbent polymer may be used as it is for production of a liquid absorbent composite. If necessary, the liquid absorbent composite is dried after mixing. The method of drying is not particularly limited, and the composite can be dried by a suitable method, e.g., under atmospheric or reduced pressure at room temperature or with heating while allowing it to stand or stirring. The water content of the liquid absorbent composite after drying is preferably 50% by weight or less, more preferably 30 wt. % or less, particularly preferably 20 wt. % or less from the standpoint of handleability and absorbency of the product. The liquid absorbent composite thus prepared has a bulk specific gravity of 0.03 to 0.7 g/cc, preferably 0.05 to 0.6 g/cc. A water absorbent polymer (A), a water-insoluble inorganic material (B) and a water-insoluble hydrophilic fibrous material (C) are in the following conditions when they constitute the liquid absorbent composite. That is, the water-insoluble hydrophilic fibrous material and the water-insoluble inorganic material form a composite in cooperation with the water absorbent polymer in the following states. 1 ○ The fiber is partly or entirely embedded in the polymer. 2 ○ The fiber is deposited on the surface of the polymer. 3 ○ The fibers are entwined with one another and party embedded in the polymer or deposited on the surface of the polymer. 4 ○ The polymer and the fiber are bonded to each other through the medium of the inorganic material. 1 ○ The inorganic material is partly or entirely embedded in the polymer. 2 ○ The inorganic material is deposited on the surface of the polymer. 3 ○ The inorganic material is deposited on the fiber which is in the state as mentioned with respect to 〈fibrous material〉 in the above items 1 ○ to 4 ○. 4 ○ The inorganic materials are agglomerated and partly embedded in the polymer or deposited on the surface of the polymer. Examples of the states of a water absorbent polymer (A), a water-insoluble inorganic material (B), and a water-insoluble hydrophilic fibrous material (C) when they constitute the liquid absorbent composite include the above-mentioned ones. However, the present invention is not limited to these examples, and it will suffice in the present invention when the components (A) (B), and (C) are practically combined. The improvement in liquid absorbency by virtue of the water-insoluble inorganic material and the water-insoluble hydrophilic fibrous material contained in the liquid absorbent composite of the present invention is remarkable particularly with respect to high-viscosity liquids. It is believed that this function was exhibited as follows. The water absorbent polymer is coated with the water-insoluble hydrophilic fibrous material, which not only improves the adaptability to an aqueous solution but also enables the polymer to be swelled even when the liquid is not directly contacted with the polymer as far as the liquid is contacted with the water-insoluble hydrophilic fibrous material with which the water absorbent polymer is coated because the liquid is sent to the polymer through the liquid guiding effect of the fiber. It is preferred that the inorganic material used in the present invention be substantially insoluble in water and hygroscopic to a certain extent. The inorganic material is partly included in the polymer. The water absorbent polymer having a smooth surface is covered with a dense coating of the finly divided inorganic material, which causes capillarity in the spaces between the inorganic material particles, thus leading to enhancement of the absorbency of the water absorbent polymer. Therefore, the combination of both the water-insoluble inorganic material and the water-insoluble hydrophilic fibrous material with the water absorbent polymer leads to an improvement in performance, i.e., the attainment of the purpose of the present invention. FIG. 1 is a cross-sectional view of various embodiments of the absorbent articles which may be prepared in accordance with the process of the present invention; FIG. 2 is a perspective view of a movable model of woman's waist; and FIG. 3 is a schematic view of an apparatus for use in determination of the rate of absorption. The above mentioned liquid absorbent composite in itself is not a satisfactory absorber, and an intended function can be exhibited only when it is used in combination with a cotton-like or sheet material. Specifically, only when the liquid absorbent composite is incorporated into a capillary structure comprised of a fiber assembly, it can have a combination of a liquid holding space, liquid diffusing properties and shape retentivity which the fiber assembly possesses. The material which is used in combination with the liquid absorbent composite is preferably those having a capability of absorbing, diffusing and holding a liquid. Specific examples of the material include hydrophilic cellulosic fibers such as pulp, rayon and cotton, and further a polyester subjected to a hydrophilic treatment, vinylon and an acrylic fiber having a number of micropores on the surface of the fiber. Since these fibers are highly hydrophilic, they have a capability of rapidly diffusing a liquid into the inside of a fiber assembly and, at the same time, can surely hold the liquid through a strong capillary action. In other words, these fibers serve to effectively transfer a liquid to the liquid absorbent composite through absorption and diffusion of the liquid and to hold the liquid until the composite completely absorb the liquid. Further, besides the above-mentioned hydrophilic cellulosic fibers, synthetic fibers having a high wet to dry tenacity ratio, such as polyethylene, polypropylene and polyester fibers, and polyethylene-polypropylene composite fibers, can be also used, and the use of these fibers serves to increase the structural stability of the absorber even during liquid absorption, which contributes to prevention of slippage and wilting of the absorber. It is apparent that when the above-mentioned both kinds of fibers are used in combination according to need, the performance of the absorber can be further improved. Various embodiments of the absorbent article which may be prepared according to the present invention will now be described with reference to a cross-sectional view as shown in FIG. 1. However, it is needless to say that the present invention is not limited to these embodiments. FIG. 1 (a) is a sheet absorber. The sheet absorber is prepared by a method which comprises uniformly applying a water-absorbent composite 4 on a sheet of paper or a nonwoven fabric 3, superimposing another sheet of paper or nonwoven fabric 3' thereon, and spraying a small amount of water in the form of a mist or applying a steam on the paper or nonwoven fabric, and drying the resulting laminate to bond the upper and lower sheets of paper or nonwoven fabrics 3,3' to each other through the liquid absorbent composite 4 which was once wetted, thereby obtaining a sheet absorber having excellent flexibility. The liquid absorbent composite 4 is applied in an amount of preferably 10 g/m2 to 300 g/m2, more preferably 30 g/m2 to 150 g/m2. FIG. 1 (b) shows another embodiment of a sheet absorber. The sheet absorber is prepared by a method which comprises mixing a pulverized pulp or cellulose powder 5 with a liquid absorbent composite 4, molding the resulting mixture into a sheet, sandwiching the sheet between upper and lower sheets of paper or nonwoven fabrics 3 and sealing the ends of the paper or nonwoven fabrics by adhesion, thereby obtaining a sheet absorber having excellent flexibility. FIG. 1 (c) is a cross-sectional view of an example of the absorbent article. The absorbent article is prepared by a method which comprises uniformly applying a liquid absorbent composite 4 on a pulverized pulp layer 5 laminated on a mount 6, laminating a pulverized pulp 5 on the composite, superimposing a mount 6 thereon, and covering the whole through covering of the lower side with a waterproof sheet 2 and covering of the upper side with a nonwoven fabric 1. A sheet of paper or a nonwoven fabric 3 may be interposed between the liquid absorbing composite 4 and the pulverized pulp layer 5. This structure is mainly suited for use in paper diapers. FIG. 1 (d) is a cross-sectional view of a further example of the absorbent article. The absorbent article is prepared by a method which comprises uniformly applying a liquid absorbent composite 4 on a pulverized pulp 5 laminated on a mount 6, laminating one to ten sheets, preferably three to six sheets of crepe paper 7 thereon, laminating a waterproof sheet 2 on the side of the crepe paper 7, laminating a rayon staple fiber 8 on the side of the pulverized pulp, and covering the whole with a nonwoven fabric 1. This structure is mainly suited for use in sanitary napkins. The absorbent article comprises a liquid absorbent composite composed of a water absorbent polymer (A) a water-insoluble inorganic material (B), and a water-insoluble hydrophilic fibrous material (C), and exhibits excellent absorbency and retentivity with respect to high-viscosity liquids including blood pus, and a loose passage which were absorbed and retained with difficulty in the prior art, which enables a remarkable reduction in tackiness on the surface of the article and leakage from the side which are mainly caused by the failure of absorption and retention of these liquids. The invention will be further illustrated below with reference to examples which may be prepared by the process thereof. It is not restricted to them. It is also directed to an absorbent articles having excellent absorbency with respect to high-viscosity liquids. Since, however, these absorbent articles can be basically treated under the same concepts, an example with respect to a sanitary napkin will now be described in more detail as a typical example of the absorbent articles. The capacity of saturation absorption, rate of absorption and absorbing power of a liquid absorbent composite, and the amount of returned liquid and maximum dynamic absorption which are measures of the effect of the present invention were determined by the following methods. Physiological saline was used as a typical example of the low-viscosity fluids, and blood as a typical example of the high-viscosity fluids. the weight (g) of the filter paper after liquid absorption. The rate of absorption was determined with an apparatus as shown in FIG. 3. A top opening 12 of a burette was stopped, and a sample mount 13 and an air hole 14 were located on the same level. 0.3 g of the liquid absorbent composite 4 was placed on a glass filter (No. 1) 15 having a diameter of 10 mm and provided in the sample mount. The amount of the defibrinated equine blood absorbed for a period of 20 min after the composite had been placed on the filter was expressed as the rate of absorption (a). The same procedures as those described with respect to the rate of absorption (a) in the above item (2-1) were repeated to determine the amount of physiological saline which the liquid absorbent composite containing 0.3 g of a water absorbent polymer (A) immobilized thereon absorbed for a period of 1 min. The value thus obtained was expressed as the rate of absorption (b). the liquid was immediately absorbed. the liquid was absorbed after 2 to 3 sec. the liquid was absorbed with gradual adaptation. the presence of the liquid remaining unabsorbed was observed after 1 hr. 10 g of pseudo-blood was injected into a test sample. A pressure of 50 g/cm2 was applied thereto. The returned liquid was absorbed by filter paper. The weight of the returned liquid determined was regarded as the amount of returned liquid. A movable model of woman's waist 9 as shown in FIG. 2 (a) was provided with a test sample 11 as shown in FIG. 2 (b) and then with a pair of shorts. The model was then subjected to walking movement at a speed corresponding to 50 m/min while pseudo-blood was injected through a dropping tube 10, thereby determining an amount of the liquid which was absorbed until the leakage from the side was caused. A 500-mℓ four-necked round flask equipped with a stirrer, a reflux condenser, a dropping funnel, and a nitrogen inlet tube was charged with 230 mℓ of cyclohexane and 1.0 g of ethylcellulose (N-100; a product of Hercules Inc.). The temperature of the resulting mixture was elevated to 75° C. Separately, 30 g of acrylic acid was neutralized in a conical flask with an aqueous solution prepared by dissolving 13.4 g of caustic soda in 39 g of water, thereby obtaining an aqueous monomer solution having a monomer concentration of 45% by weight (water content: 55% by weight). 50 mg of potassium persulfate and 65.5 mg of polyoxyethylene glycol diacrylate having 12 oxyethylene units on the average were then added to the monomer solution and homogeneously dissolved therein. The monomer solution was dropped in the above-mentioned four-necked flask in a nitrogen atmosphere for 1.5 hr, thereby causing polymerization. The contents of the flask were kept at 70 to 75° C for 0.5 hr to complete the polymerization. The polymerization product was separated by filtration and then dried at 80° C in vacuo to obtain a water absorbent polymer (A-1). 20 g of the water absorbent polymer (A-1), 100 g of ion-exchanged water, 10 g of bentonite, and 10 g of cellulose powder (CF11; a product of Whatman Inc.; a fiber length of 500 µm) were kneaded for about 10 min with a twin kneader-mixer. The resulting product was dried at 80° C in vacuo to obtain a liquid absorbent composite. The observation of the liquid absorbent composite under an electron microscope revealed that the bentonite and cellulose powder were immobilized on the surface of the water absorbent polymer (A-1). The composite had a bulk specific gravity of 0.24 g/cc. A 500-mℓ four-necked round flask equipped with a stirrer, a reflux condenser, a dropping funnel, and a nitrogen inlet tube was charged with 230 mℓ of cyclohexane and 1.0 g of ethylcellulose (N-100; a product of Hercules Inc.). The temperature of the resulting mixture was elevated to 75° C. Separately, 30 g of acrylic acid was neutralized in a conical flask with an aqueous solution prepared by dissolving 13.4 g of caustic soda in 39 g of water, thereby obtaining an aqueous monomer solution having a monomer concentration of 45% by weight (water content: 55% by weight). 50 mg of potassium persulfate was then added to the monomer solution and homogeneously dissolved therein. The monomer solution was dropped in the above-mentioned four-necked flask in a nitrogen atmosphere for 1.5 hr, thereby causing polymerization. The contents of the flask were kept at 70 to 75° C for 0.5 hr to complete the polymerization. Thereafter, the resulting polymerization product was subjected to azeotropic dehydration (while refluxing cyclohexane), thereby adjusting the water content of the polymer dispersed in cyclohexane to 35% by weight. Then, an aqueous solution prepared by dissolving 0.03 g of tetraglycerol tetraglycidyl ether (a trade name: Denacol EX-512; a product of Nagase & Co., Ltd.) in 1 mℓ of water was added at 73° C. The resulting mixture was kept at that temperature for 2 hr, followed by removal of cyclohexane. The polymer thus obtained was dried a 80° C in vacuo to obtain a water absorbent polymer (A-2). The same procedures as in Example 1 were repeated using 20 g of a water absorbent polymer (A-2), 200 g of ion-exchanged water, 10 g of bentonite, and 10 g of cellulose powder, thereby obtaining a liquid absorbent composite comprising a water absorbent polymer (A-2) and bentonite and cellulose powder each immobilized thereon and having a bulk specific gravity of 0.27 g/cc. The same procedures as in Example 1 were repeated, except that, in order to change the composition of the liquid absorbent composite, 10 g of alumina was used instead of bentonite and the amount of the ion-exchanged water was 60 g, thereby obtaining a liquid absorbent composite comprising a water absorbent polymer (A-1) and alumina and cellulose powder each immobilized thereon and having a bulk specific gravity of 0.21 g/cc. The same procedures as in Example 1 were repeated, except that, in order to change the composition of the liquid absorbent composite, 20 g of a pulp (fiber length: 5 mm) was used instead of cellulose powder and the amount of the water absorbent polymer (A-1) was 10 g, thereby obtaining a liquid absorbent composite comprising a water absorbent polymer (A-1) and bentonite and a pulp each immobilized thereon and having a bulk specific gravity of 0.26 g/cc. A water-insoluble water absorbent polymer (A-3) in the form of white powder was prepared from corn starch, acrylic acid, acrylamide, and ethylene glycol dimethacrylate according to the method as described in Example 4 of Japanese Patent Laid-Open No. 62463/1986. The same procedures as in Example 1 were repeated using the water absorbent polymer (A-3) thus obtained, thereby obtaining a liquid absorbent composite comprising a water absorbent polymer (A-3) and bentonite and cellulose powder each immobilized thereon and having a bulk specific gravity of 0.22 g/cc. 2 g of bentonite and 100 g of water were mixed with each other in a screw rotary vane mixer. 20 g of a water absorbent polymer (A-1) was used in Example 1 and 2 g of cellulose powder were successively added to the resulting mixture, followed by kneading for 5 min. The resulting product was dried at 80° C in vacuo to obtain a liquid absorbent composite comprising a water absorbent polymer (A-1) and bentonite and cellulose powder each immobilized thereon and having a bulk specific gravity of 0.52 g/cc and a water content of 11 percent. The same procedures as in Example 1 were repeated, except that, in order to change the composition of the liquid absorbent composite, the amounts of bentonite and cellulose powder were each 200 g, thereby obtaining a liquid absorbent composite comprising a water absorbent polymer (A-1) and bentonite and cellulose powder each immobilized thereon and having a bulk specific gravity of 0.08 g/cc. A water absorbent polymer (A-1) as prepared in Example 1 was used as Comparative Example 1. The same procedures as in Example 1 were repeated, except that no cellulose powder was used, thereby obtaining a liquid absorbent composite comprising a water absorbent polymer (A-1) and bentonite immobilized thereon and having a bulk specific gravity of 0.81 g/cc. The same procedures as in Example 1 were repeated, except that no bentonite was used, thereby obtaining a liquid absorbent composite comprising a water absorbent polymer (A-1) and cellulose powder immobilized thereon and having a bulk specific gravity of 0.31 g/cc. The capacity of saturation absorption, rate of absorption, and absorbing power were evaluated with respect to each of the liquid absorbent composites obtained in Examples 1 to 7 and Comparative Examples 1 to 3. The results are shown in Tables 1 and 2. As can be seen from Tables 1 and 2, the liquid absorbent composites which may be prepared by the process of the present invention exhibited absorbency with respect to both the low-viscosity liquid and the high-viscosity liquid superior to those attained by the comparative examples. Particularly, they exhibited unprecedentedly excellent capacity of saturation absorption, rate of absorption and absorbing power with respect to the high-viscosity liquid. 20 g of the polymer (A-2) obtained in Example 2, 200 g of ion-exchanged water and 5 g of kaolin were successively fed into a twin kneader-mixer while stirring an kneaded therein for 5 min, followed by addition of 5 g of kaolin and 10 g of cellulose powder. The resulting mixture was kneaded for 15 min and then dried at 80° C in vacuo to obtain a liquid absorbent composite comprising a water absorbent polymer (A-2) and kaolin and cellulose powder each immobilized thereon. The composite had a bulk specific gravity of 0.28 g/cc and a water content of 14% by weight. The same procedures as in Example 1 were repeated, except that 10 g of alumina was used instead of bentonite, that the amount of the ion-exchanged water was not 100 g but 20 g, and that the ion-exchanged water was added not in the form of a liquid but by spraying. Thus, there was obtained a liquid absorbent composite comprising a water absorbent polymer (A-1) and alumina and cellulose powder each immobilized thereon and having a bulk specific gravity of 0.22 g/cc. The water content of the liquid absorbent composite was 8% by weight. 10 g of a water absorbent polymer (A-1) was added to 500 g of cyclohexane. 100 g of ion-exchanged water was dropped into the resulting mixture while stirring. Then, 10 g of kaolin and 10 g of a pulp (fiber length: 5 mm) were added thereto, followed by stirring for about 1 hr. The resulting product was separated by filtration and dried to obtain a liquid absorbent composite comprising a water absorbent polymer (A-1) and kaolin and a pulp each immobilized thereon. The composite had a bulk specific gravity of 0.16 g/cc and a water content of 13% by weight. 10 g of the polymer (A-3) obtained in Example 5, 200 g of ion-exchanged water, 100 g of talc and 100 g of cellulose powder were successively fed into a twin-cylinder blender of a rotary container type. The blender was rotated for about 1 hr, and the resulting blend was dried at 80° C in vacuo, thereby obtaining a liquid absorbent composite comprising a water absorbent polymer (A-3) and talc and cellulose powder each immobilized thereon and having a bulk specific gravity of 0.25 g/cc. The liquid absorbent composite has a water content of 16% by weight. The same procedures as in Example 1 were repeated, except that the twin kneader-mixer was heated at 80° C and that the kneading was conducted with the kneader-mixer closed tightly. Thus, there was obtained a liquid absorbent composite comprising a water absorbent polymer (A-1) and bentonite and cellulose powder each immobilized thereon and having a bulk specific gravity of 0.22 g/cc. The liquid absorbent composite had a water content of 9% by weight. A water absorbent polymer (A-1), bentonite, and cellulose powder were mixed with each other in the same manner as in Example 1, except that no ion-exchanged water was added. The observation of the resulting mixture under an electron microscope revealed that bentonite and cellulose powder were not immobilized on the water absorbent polymer (A-1). The mixture had a bulk specific gravity of 0.25/cc. The same procedures as in Example 1 were repeated, except that the amount of the ion-exchanged water was 800 g. However, the mixture became pasty in the step of kneading, which not only made it difficult to conduct kneading but also required a long time in subsequent steps of drying and pulverization. The resulting composite had a bulk specific gravity of 0.31 g/cc and a water content of 18% by weight. The observation of the composite under an electron microscope revealed that most of the bentonite and cellulose powder was included within the composite. The capacity of saturation absorption, rate of absorption, and absorbing power were evaluated with respect to each of the liquid absorbent composites obtained in Examples 8 to 12 and Comparative Examples 4 and 5. Results are shown in Tables 3 and 4. It is noted from the data of Tables 3 and 4 that the composites obtained by the new process of the invention exhibited an excellent absorbency with respect to both the low-viscosity liquid and the high-viscosity liquid. Particularly, they were remarkably superior in capacity of saturation absorption, rate of absorption and absorbing power with respect to the high-viscosity liquid to those of the products obtained in the comparative examples. 20 g of polysodium acrylate as the water absorbent polymer (A), 100 g of ion-exchanged water; 10 g of bentonite as the water-insoluble inorganic material (B), and 10 g of cellulose powder (CF11; a product of Whatman Inc.; a fiber length of about 500 µm) as the water-insoluble hydrophilic fibrous material (C) were kneaded with each other for about 10 min by means of a twin kneader. The resulting product was dried at 80° C in vacuo to obtain a liquid absorbent composite. The observation of the composite under an electron microscope revealed that the bentonite and cellulose powder were immobilized on the surface of the water absorbent polymer. The composite had a bulk specific gravity of 0.24 g/cc. 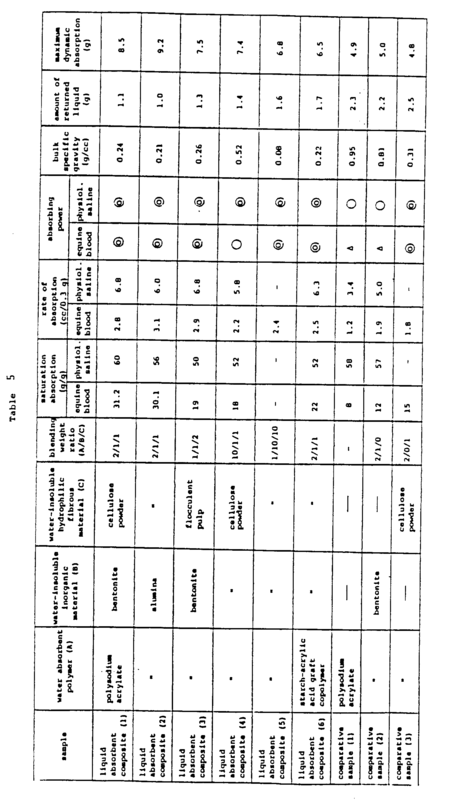 Liquid absorbent composites were prepared in the same manner as that mentioned above, except that the water absorbent polymer (A), the water-insoluble inorganic material (B), and the water-insoluble hydrophilic fibrous material (C) were varied as shown in Table 5. The absorbency of the liquid absorbent composites thus obtained is shown in Table 5. For comparison, the absorbency of a comparative sample consisting of only the water absorbent polymer (A), a comparative sample consisting of only the water absorbent polymer (A) and the water-insoluble inorganic material (B), and a comparative sample consisting of only the water absorbent polymer (A) and the water-insoluble hydrophilic fibrous material (C) is also shown in Table 5. Sanitary napkins having a structure as shown in Fig. 1(d) were prepared from the liquid absorbent composites and comparative samples thus obtained. In the preparation of the sanitary napkins, the absorbing layer was formed from 0.6 g of a liquid absorbent composite, 2.0 g of flocculent pulp, 1 .5 g of absorbent paper and 0.3 g of rayon staple fiber, while the surface sheet was formed from a heat bonded nonwoven fabric composed of 65% of a polyester fiber and 35% of a polyethylene/polypropylene composite fiber and having an areal weight of 20 g/m2. Further, a laminate composed of waterproof paper (25 g/m2) and 10 µm-thick polyethylene laminated thereon was used as the waterproof sheet. The amount of returned liquid and maximum dynamic absorption were determined with respect to each sanitary napkin thus obtained. The results are shown in Table 5. As can be seen from Table 5, the absorbent articles which may be prepared by the process of the present invention exhibit excellent absorbency with respect to high-viscosity liquids such as blood. A process for manufacturing a liquid-absorbent composite which composite comprises (a) a particulate water-absorbent polymer, (b) a water-insoluble inorganic material and (c) a water-insoluble hydrophilic fibrous material having a fibre length not greater than 50 mm at a weight ratio (a) : (b): (c) within the range 100 : 5-1200 : 5-1200, wherein (b) and (c) are present on the surface of the particles of (a), the process comprising the steps of (i) mixing (a), (b) and (c) with one another in the presence of 70 to 3000 parts by weight, based on 100 parts by weight of (a), of water, and (ii) drying the mixture. A process as claimed in claim 1, which has a bulk specific gravity of 0.03 to 7 g/cc. A process as claimed in claim 1, in which the polymer (a) is a polymer of a water-soluble, ethylenically unsaturated monomer or a crosslinked product thereof, including acrylic acid or a salt of acrylic acid as the major component. A process as claimed in claim 1, in which the inorganic material (b) is selected from alumina, silica, zeolite, a clay of the montmorillonite group and a clay of a kaolinite group. A process as claimed in claim 1, in which the fibrous material (c) is cellulose, natural or artificial. An absorbent article which comprises an absorbent composite obtained by the process of claim 1. TR200102991T2 (en) * 1999-04-16 2002-02-21 Kimberly Clark Worldwide, Inc. Nit and absorbent article having free-flowing particles. BR112012002955A2 (en) * 2009-08-14 2018-03-13 Procter & Gamble fibrous structures and methods of manufacturing the same.